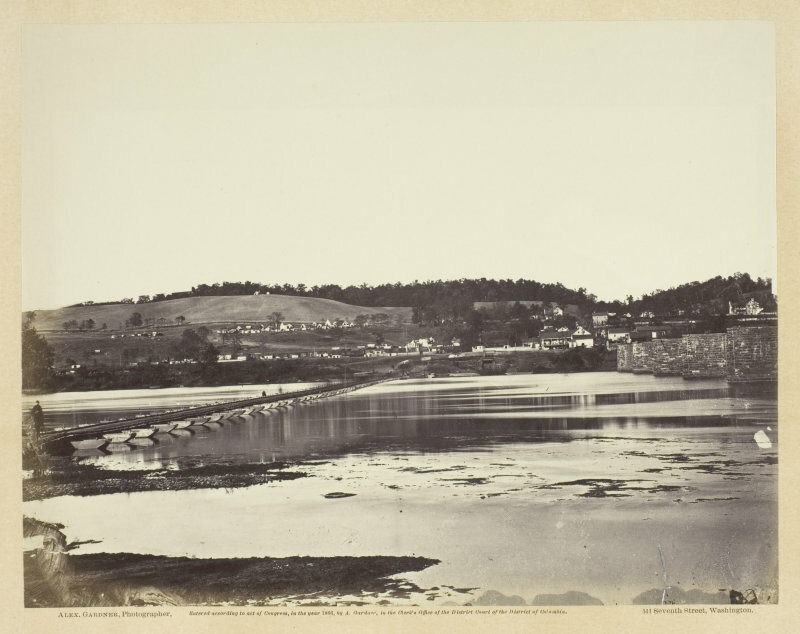 Pontoon bridge across the Potomac at Berlin. 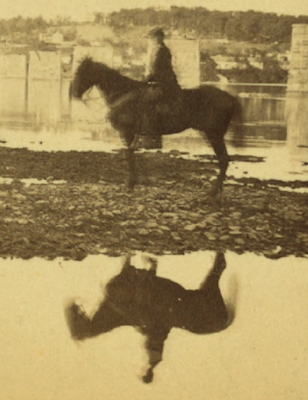 Correspondence of the Boston Traveler. SOUTH ATLANTIC SQUADRON, MORRIS ISLAND, S.C., Dec. 7, 1863. For some time past nothing of interest has occurred at this point. We have had a few days of cold and nights of freezing weather. Yesterday, however, there occurred to the fleet the worst disaster of the siege. 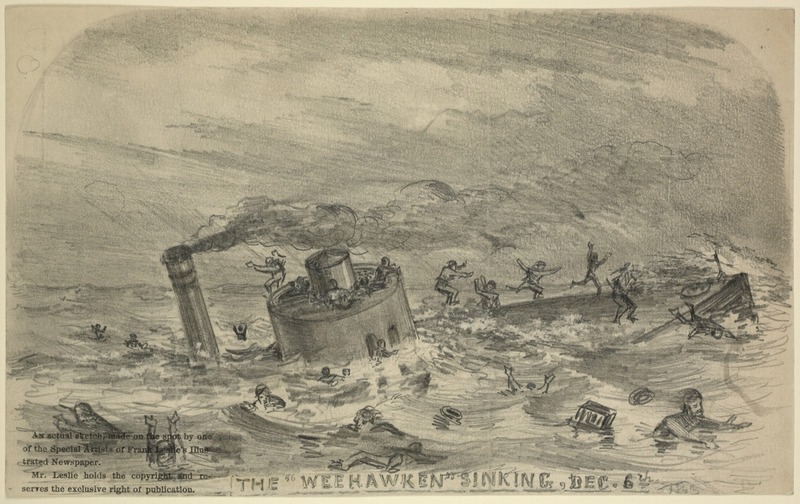 The famous iron-clad Weehawken, so gallantly fought by Capt. JOHN ROGERS, and recently by Commander CALHOUN, has sunk off Morris Island. On Saturday, the 5th inst., we had a calm Summer's day. About midnight the breeze sprung up from the northeast, and blew a gale. The vessels that rode at their anchors so quietly on Saturday now plunged fearfully. The Ironsides lay about two miles from Sumter, the Montauk was on picket, the Nahant was to the northeast about two hundred yards, and the Weehawken to the southwest about a hundred yards. Commander CALHOUN had been sent home, unfit for duty, a short time previously. 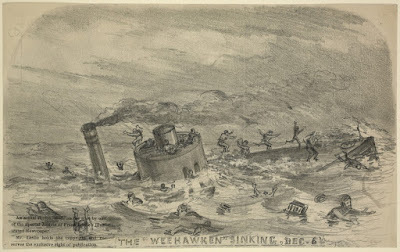 Commander DUNCAN, of the Paul Jones, took charge of the Weehawken on Saturday, the 5th inst. During the forenoon of Sunday, Commander DUNCAN visited the flagship, and while there the Weehawken shipped a heavy sea, which entered the forward hatch and filled the anchor-room. This anchor-room is a water-tight compartment with a valve under the cabin door to let aft the water to the pumps, but at this time it must have been out of order, as the water could not get aft. The cabin door was closed, yet the bars that were to hold it in its place, (so as to keep the water in the anchor-room,) could not be found. The officers and men, inured to dangers of this kind, seemed to care but little for what was going on. They went below and quietly partook of their dinner, but soon after they were astonished at the rapidity with which the water was gaining upon them. 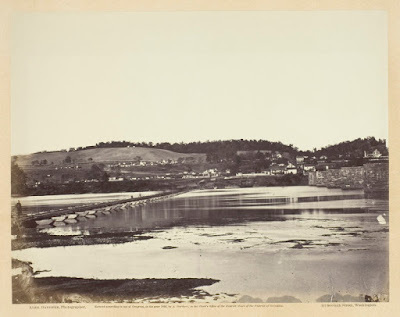 The executive officer commenced to pay out chain, but the hawse-pipe was soon under water and a six-inch stream came pouring in. The paying out of the chain did not relieve the ill-fated vessel. 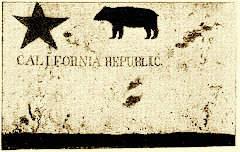 JOHN ROGERS was not there. Presently the cry "She sinks!" resounded through the vessel, and signals of distress were made to the flagship; boats were lowered from all vessels knowing the signals, but before they could reach her she sunk how first in five fathoms water, carrying with her twenty-six men and four engineers, including men in irons and men sick; also men at work in the engine-room—supposed the whole watch on duty at the time. It is presumed that when the water reached the forward part of the boilers it made steam so suddenly as to suffocate all hands in the engine-room, as not one who was there escaped. The yeoman was picked up, but died soon afterward. Much credit is due Capts. AMMEN and BRADFORD of the navy for their great exertions made to save the perishing sailors. A charge of want of proper care would seem to rest upon the officers of the Weehawken. Some, however. have advanced the idea that the forward overhang of the lost vessel has broken off, but Mr. HUGHES, Inspector of Iron-clads, thinks that cannot be the case. If the Weehawken is ever raised, it will then be known where the blame, if any, rests. The Weehawken had but recently returned from Port Royal, and had an unusual quantity of shot and shell on board, which probably settled her too far in the water. It is calculated that when these vessels are under water but fifteen inches, that two hundred tons would sink them bodily, consequently a much less weight would carry them down bow first. Major General John A. 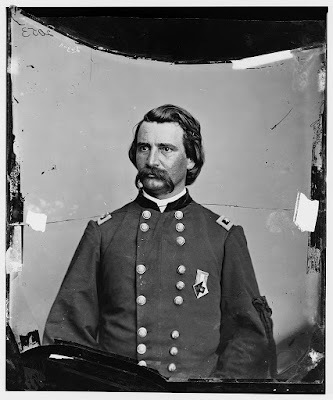 "Black Jack" Logan, from the Library of Congress. Civil War Trust's biography of John Logan is here. (1) Monument of Gen. John A. Logan, Chicago, Ill. (on horseback, with group of people, mostly seated on lawn, in foreground), c1900; (2) Logan, wartime portrait; (3) Washington, District of Columbia. The Grand Review of the Army. 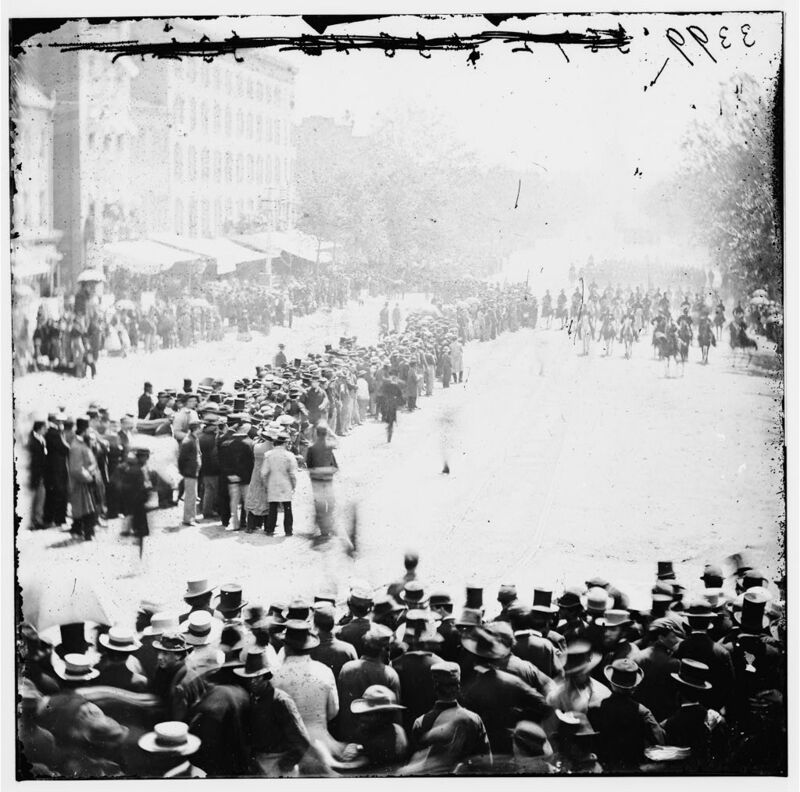 Gen. John A. Logan's 15th Army Corps passing on Pennsylvania Avenue near the Treasury, May 1865, Mathew Brady.